Light Duty Conveyor Curves and Spurs - Roll-A-Way Conveyors Inc.
45° and 90° roller curves move products in various directions providing versatility to straight conveyors. Used in various applications to complete a warehouse system. For additional product protection, guard rails can be mounted to curve. These 45° and 90° roller spurs are used for converging and diverging several lines of material onto a main line. 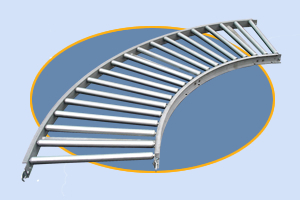 Specially made for use in limited access areas where exact entry is required by joining two or more lines of conveyor. Various angles available. Specify right or left hand unit.